For any individual that is seeking a party bus in Highland Park, then the search is now finally at an end. Here at Rockstarz Limousine and Party Bus, we specialize in making sure that each of our clients and their guests have an amazing time on board our bus, no matter the reason for the initial celebration. 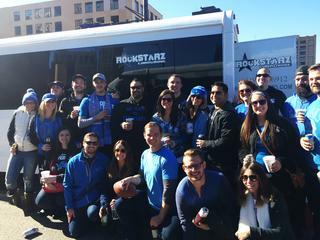 Our Highland Park party bus rental option has been designed in such a way so as to provide you with the opportunity to invite even more people than before. From the way in which we have created as much space on board, to the layout of the seats that are available, it just means that you can expand on your guest list allowing even more people to enjoy their time spent with us. In addition, we have worked hard to produce something that has an amazing atmosphere for you all to enjoy. From the moment that you step on board, you will be stunned at the décor and that’s before you even encounter our sound system and laser light display that is there to really give an extra something to the atmosphere. In the past, we have had individuals using our Highland Park party bus service for a wide range of special occasions. Whether it be a normal or special birthday, an anniversary, a bachelor or bachelorette party, or maybe just a group of friends getting together for a different kind of evening, we can help you to arrange your perfect event from start to finish. So, any individual that lives in the Highland Park area and who is seeking a party bus, should give us a call now at Rockstarz Limousine and Party Bus. The other option is to use our online contact form, and a member of our team will be in touch as soon as possible in order to discuss your own individual requirements.